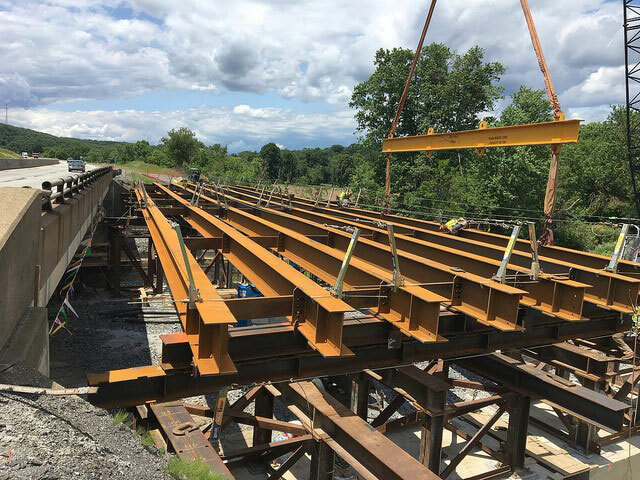 Harrisburg, Pa. — STV is playing a key role in supporting the Pennsylvania Turnpike Commission’s (PTC) first foray into accelerated bridge construction (ABC) throughout the Keystone State. STV has been contracted by the PTC to perform construction management and inspection services, including constructability reviews, cost estimating, value engineering, bid reviews and packaging, and project scheduling, for five Pennsylvania Turnpike bridges using ABC methodology. “The PTC has turned to the ABC method because they found it improved safety conditions for both motorists and construction teams while being a more cost-effective way to replace bridges within a short timeframe,” said Leonard Smith, P.E., STV vice president and the Pennsylvania business unit leader in the firm’s Transportation & Infrastructure Division. The first of these ABC projects – and the agency’s very first time using the methodology – occurred in late September with the replacement of twin, 150-foot-long, two-span bridge superstructures over Brush Creek on Interstate-76 in Beaver County, PA. The bridges were successfully replaced in less than 55 hours over one weekend. Immediately following the replacement, the PTC and the project team coordinated a “lessons-learned” session so efficiencies could be applied to the next series of ABCs. A second structure was replaced during a 55-hour window in Lehigh County in eastern Pennsylvania in mid-October. That bridge was a 60-year-old, three-span, 131-foot-long structure at the crossing of the Turnpike’s Northeast Extension (I-476) over Crackersport Road. The remaining three bridges in the firm’s contract with PTC are tentatively scheduled to be replaced over the course of the ABC program, which runs through 2022. All of these bridge replacements also featured a significant public outreach component in advance of weekend closures. While weekend traffic volumes tend to be lower than during the work week, the project team still needed to coordinate construction around a number of Saturday/Sunday events like holidays and local college football games that attracted tens of thousands of spectators and fans from around the region. View a time-lapse video of the project at https://youtu.be/htw7eqEKB1I.